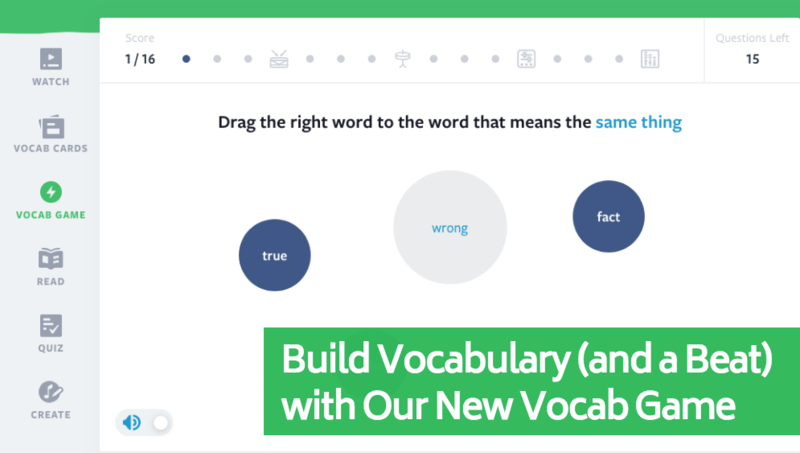 We’re super excited to introduce you to our newest feature, the Vocab Game! The Vocab Game is an additional way for students to practice a lesson’s vocabulary through multiple contexts. Students can build a beat by successfully identifying images, completing sentences, matching definitions and selecting synonyms for the lesson’s vocabulary words. This feature is also automatically graded, and features Comprehension Analysis, which allows teachers to assess the performance of individual students and the class after assigning the activity. The Vocab Game is a new activity in every Flocab lesson that allows students to practice and reinforce vocabulary words. Students build a beat by earning new sounds and instruments as they answer vocabulary questions correctly. Game questions assess word meanings in multiple ways. Students match the words to definitions, synonyms, antonyms, images and fill-in-the-blank Flocab lyrics. Each word is assessed with two of the different question types. There are around 20 questions in the Vocab Game. In the game, students receive immediate feedback about whether or not they answered each question correctly. If they answer the question correctly, they will be moved on to the next question immediately. If a student answers a question incorrectly, the game will notify them with a red icon and by highlighting the correct vocabulary word. As students answer questions correctly, they earn new instruments to build a beat. To build the full beat, students must get all the questions right. When students finish the game, their score will appear. Students also have the option to play again or go through their answers. 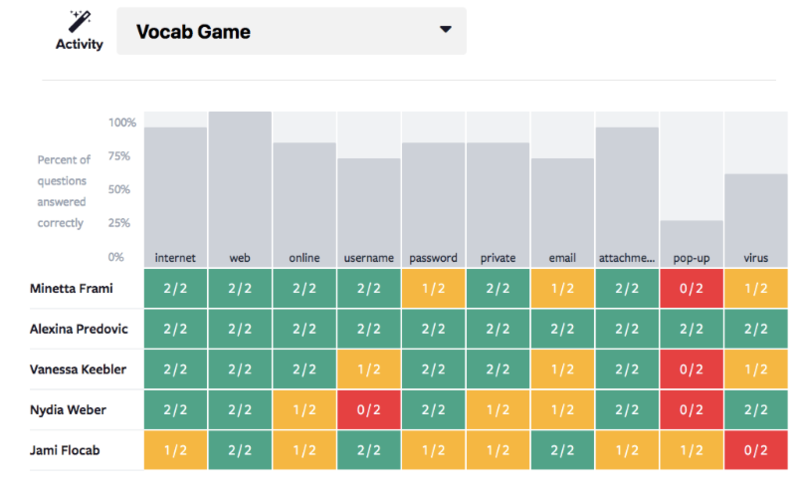 By playing the Vocab Game on different lessons, students can unlock 43 different beats. You also always have the ability to turn the music off at any point during the activity. Teachers can assign the Vocab Game to a class, in addition to all our existing assignable activities. While inside the Vocab Game assignment, students will be blocked from the Vocab Cards. Once they complete the assignment, they will regain the ability to explore the activities. When the game is completed in an assignment, teachers can access a review screen for each student in “Individual Review” via the assignment in My Classes. Students can also re-access this screen for themselves in My Assignments. The Vocab Game also provides in-depth Comprehension Analysis for each individual student as well as the entire class, which can help identify gaps and inform future instruction. Comprehension Analysis is organized by word and shows how each student in the class performed on each word. The Vocab Game will be available on all Flocabulary lessons by August, and can be found on most units starting today. So try it with your students before heading out for the summer, and let us know what you think! Shoot us a tweet, or drop us a line at info@flocabulary.com. I was looking at the new vocabulary game. Are the vocabulary words already set up in the game or can you customize it to use on our own weekly ELA curriculum words? already set up in the game from the words in that lesson! I may be interested in this in August. I am now done with school.